Erin and Dr. Vance Lassey of Holton have transformed the former J.C. Penney building on the west side of the Holton Square into a coffee shop with a large event space available for receptions, parties and other special occasions. Penny’s, which is a nod to the department store that occupied the building for many years, opened Nov. 5 after undergoing major remodeling. Previous businesses that occupied that space included All Around Sweets-n-Eats and Wilhelm Heating and Hardware. The Lasseys considered building something new, but then snatched up the former J.C. Penney building at 409 New York when All Around Sweets-n-Eats closed last fall. Built in 1938, the building housed J.C. Penney for many years, and during the remodeling, the Lasseys kept the original floors and some exposed brick walls. New bathrooms and walls were constructed to separate the event space from the coffee shop. “We did a lot of the work ourselves and spent many late nights here,” she said. The Lasseys serve PT’s Coffee at Penny’s, which is a roasting company based in Topeka. 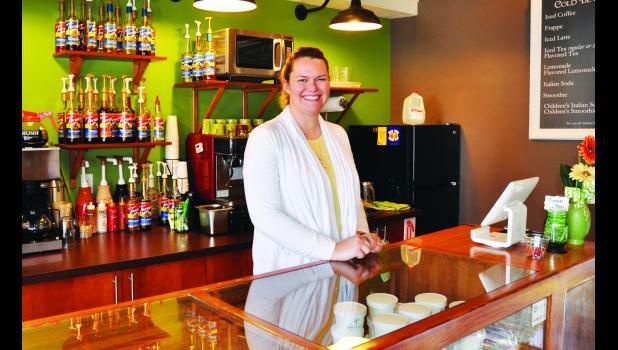 While she serves regular and decaf coffee, the menu also includes mochas, lattes, frappes and macchiatos. The business also offers cold brewed coffee. Other drinks available include Italian sodas, flavored ice tea (sweet and unsweetened) and lemonade, smoothies and hot chocolate. Kid-friendly drinks are available, and a play area has been set up on the upper level of the building that also has tables for moms to sit and enjoy their drinks, Erin said. Erin offers a variety of baked goods, including quiche, doughnuts, cinnamon rolls, cookies, muffins and a breakfast ham and cheese pastry. Oatmeal-to-go items are also available for purchase. Erin said that cupcakes are her specialty, with such flavors as Biscoff (which is a graham cracker type cookie) and pink lemonade. Penny’s is open 7 a.m. to 5 p.m. Monday through Thursday, 7 a.m. to 2 p.m. Friday and 8 a.m. to noon on Saturday. “We’ll be open during special events on the Square, like Second Saturdays or movie night,” she said. The open reception area includes refinished hardwood flooring, a built-in sound system, custom lighting and a hardwired projector. Rental prices vary depending on the needs of the event and how long it’s being used for, Erin said. The event space was used in October to host the dinner theatre production, as well as a concert by regional artists. Erin can offer her baking and coffee services for events but allows those renting the space to bring in their own caterer. The Lasseys have lived in Holton for eight years. They have two children, Luke, 7; and Rebekah, 5. For more information about Penny’s, call 785-362-6043 or email pennysholton@gmail.com.